As we have seen in the last chapter, the private key is one of the most important components of the "public key" or asymmetric encryption method. 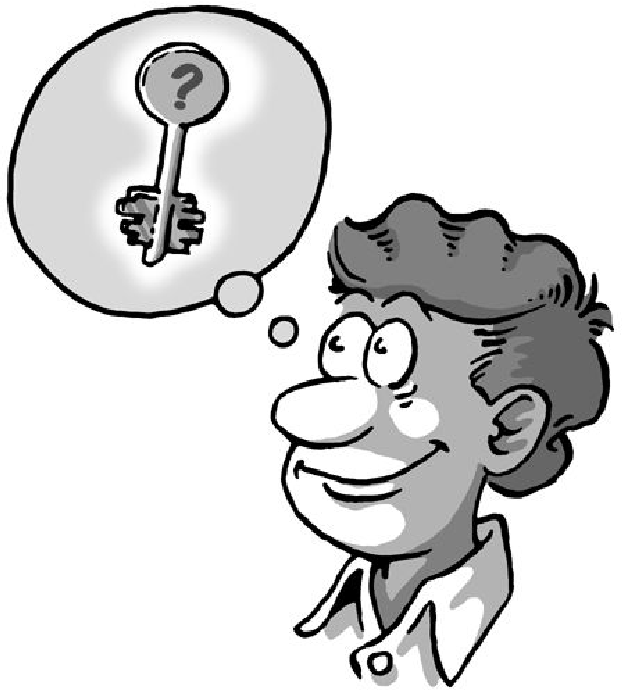 While one no longer needs to exchange the key with another party in secret, the security of this key is nevertheless the "key" to the security of the "entire" encryption process. First, no other user may read or write in the file - which is difficult to warrant, since computer administrators always have access to all files, and the computer may be lost or attacked by viruses, worms or Trojans . For this reason we need another layer of protection: the passphrase. This is not a password - a passphrase should not consist of only one word, but a sentence, for example. You really should keep this passphrase "in your head" and never have to write it down. At the same time, it cannot be possible to guess it. This may sound contradictory, but it is not. There are several proven methods of finding very unique and easy to remember passphrases, which cannot be easily guessed. People in glass houses should not be throwing stones. While it may not be easy to remember this sequence of letters, it is also unlikely that you will forget how to arrive at the passphrase it as long as you remember the original sentence. Over time, and the more often you use the phrase, you will commit it to memory. No one else can guess the passphrase. Think of an event that you know you will never forget about. Maybe it's a phrase that you will always associate with your child or partner, i.e. it has become "unforgettable". Or a holiday memory or a line of text of a song that is personally important to you. Use capital and small letters, numbers, special characters and spaces, in any order. In principle, anything goes, including umlaute, special characters, digits etc. But remember - if you want to use your secret key abroad at a different computer, please remember that not all keyboards may have such special characters. For example, you will likely only find umlaute (ä, ö, ü usw.) on German keyboards. In München steht ein Hofbräuhaus. Knitting an accordeon, even during storms. A passphrase of this length provides good protection for your secret key. THe ExPERt laMenTIng NuclEAr hoMES. While the passphrase is now shorter, it is also more difficult to remember. If you make your passphrase even shorter by using special characters, you will save some time entering the passphrase, but it is also morr likely that you will forget your passphrase. However, in practice, such sequences of characters have not proven themselves to be very useful, since there are simply too few clues by which to remember them. ... is already used for another purpose (e.g. for an e-mail account or your mobile phone). The same passphrase would therefore already be known to another, possibly not secure, software. If the hacker is successful, your passphrase becomes virtually worthless. ... comes from a dictionary. Passphrase finder programs can run a password through complete digital dictionaries in a matter of minutes - until it matches one of the words. ... consists of a birth date, a name or other public information. Anyone planning to decrypt your e-mail will obtain this type of information. ... is a very common quote, such as "to be or not to be". Passphrase finder programs also use quotes like these to break passphrases. ... consists of only one word or less than 8 characters. It is very important that you think of a longer passphrase. When composing your passphrase, please do not use any of the aforementioned examples. Because anyone seriously interested in getting his hands on your passphrase will naturally see if you used one of these examples. Be creative! Think of a passphrase now! Unforgettable and unbreakable. In Chapter 7 you will need this passphrase to create your key pair. But until then, you have to address another problem: Someone has to verify that the person that wants to send you a secret message is real.